Nice review :) Through only few apps covered , while there is loots more in coming Enhancer (and new stuff, and old ones which updated a lot). Last edited by kas1e on 05-Sep-2018 at 01:38 PM. Will it be released at Amiwest ? looking forward to download the update! Must update the XE to the One that has a new clock! The SDK is not mandatory, you only need it for developing software using the wide range of gadgets, classes and libraries supplied in Enhancer Software. Most users will not need the SDK files. This is correct of course. I said in my blog post that it is worthwhile to install the SDK, I didn't say it was required. Perhaps I should have been clearer it is optional. That said, the example OpenGLES/Warp3D Nova programs from Enhancer install in the SDK drawer on my system. Not sure where they go if the SDK is not installed...hence my thinking it is worthwhile to install it first. Last edited by Epsilon on 06-Sep-2018 at 11:16 AM. Thanks for the clarification Epsilon. Thanks for the Blog Epsilon. As usual, top notch quality! And to Aeon/Matthew for your hard work! While Im not a developer, so it doesnt apply to me; If its hard to get hold of the SDK, maybe make a guide/highlight the process required to get hold of it? Amiga (be it classic and NG) needs more developers, and its counterproductive having core aspects of development being troublesome to get hold of. I realise its not AEONs responsibility to cover for this aspect, just throwing it out there. It requires some skills but it's not super hard, there is no logins required to access it etc but you must be able to google it and click on the mouse. Many thanks for your kind words. The team contribute weekly to this project in their spare time and the warm response to this work makes it all worthwhile. As regards making development easier, we had a big discussion about it during our recent Amiga Developer meeting in Cardiff in June. From that meeting one of our developers has written the Libraries and Devices Construction Kit (LDCK). This will be available as a free download on Updater tool in the near future (it is currently undergoing beta test). We are looking at other ways of expanding the SDK and development tools in the Enhancer Software. I expected that response, and I agree 100%. Completely immersed in the history of both development and the OS, and find navigating the hudles of obscurity second nature. Thats fine, and its the nature of a "dead" OS. But I assume we want to attract people that are curious about old/different stuff, but doesnt really have the past expirience to help them along. Having to ask on forums for weeks to get a coherent picture of whats needed for ANYTHING, is not very helpful. Im not going to get into the discussion of the validity of attracting new developers, cause thats a 100 page thread in the making. It easily available on the hyperion site. 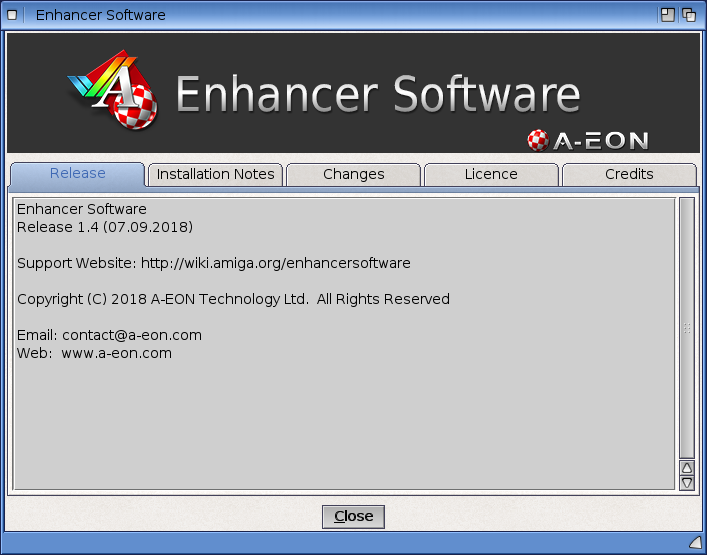 Clicki downloads, choose the AmigaOS 4.x Software Developement Kit, coose the 53.30 linkfrom the another cick your have the download link. I'm interesting in learning about any update to the Radeon drivers that I didn't see mentioned. Very good Job Epsilon pages, AmigaKit from the add ons and Trevor for the work. Hyperion pages working. Just 2017 last updates.